Good news everyone! Juliet is 13 weeks pregnant now and we are very excited. My parents are coming to visit us in a few weeks and we hope to spend a lot of family time together. 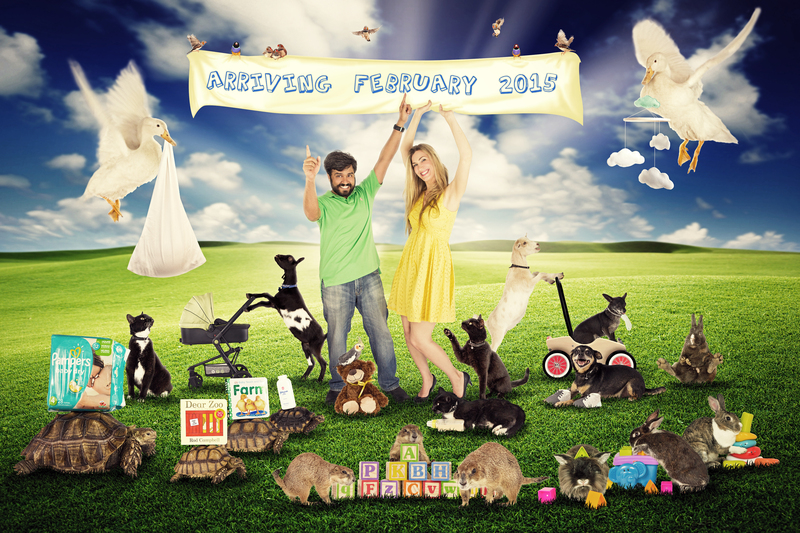 My friend Tony created the glorious announcement image above from photos taken with the help of our friend Kelly. We took individual photos of all of our animals and even balanced diapers and baby powder bottle on the back of our tortoises. While no animals were harmed in the making of this image, I was peed on, pooped on, spat on, licked, clawed, gnawed, and thoroughly scratched while helping Kelly and Juliet take all of the individual animal photos. I'm not complaining though. I think of it as training to be a parent.